A warm welcome to all of the 2019 Carnegie and Kate Greenaway Awards shadowing groups! It’s an exciting time in the medals’ annual calendar as shadowing officially begins with the shortlist announcement on Tuesday 19 March 2019. I hope you will find books which inspire and entertain, as well as provoke discussion with your peers and group leaders; I also look forward to reading your reviews and insights and to taking a look at your artwork and videos. This year, I am delighted to announce the introduction of the inaugural Shadowers’ Choice Awards. For the first time in the medals’ illustrious history the overall winners of the Shadowers’ vote for their favourite shortlisted Carnegie and Kate Greenaway Medal titles will be publicly announced and presented at the prestigious awards ceremony at the British Library on Tuesday 18 June 2019. 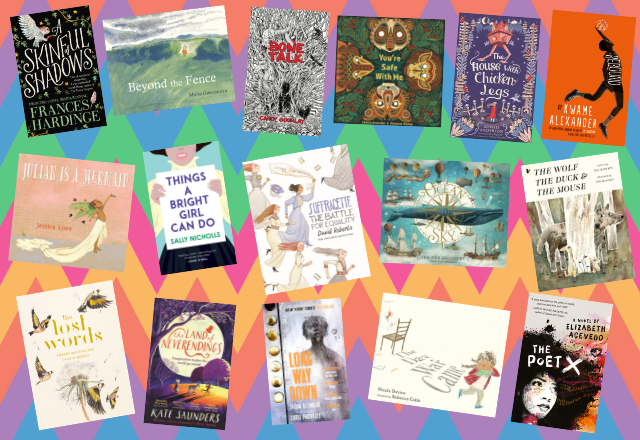 So, whether you are rebounding with Charlie Bell and eating Grandma’s peach pie, travelling through Europe with Marinka and her quirky house, waiting with Piggy for Wild Pig to lead him to freedom beyond the fence or feasting with Duck and Mouse in the Wolf’s belly, there are wonderful worlds to explore in these 16 superb books. I hope you enjoy reading them as much as the judges and I have – thank you so much on behalf of us all for participating in the 2019 shadowing initiative.